For as long as I can remember my siblings and I have heard the story of how our mother survived a lightning accident in Darby Canyon, Idaho while 5 of her friends had died. This accident occurred on Aug 1, 1951 when my mother was 14 years old. It has made all of us aware of how dangerous it can be during a thunder and lightning storm as my mother would diligently get us inside whenever the clouds would gather and the wind picked up. 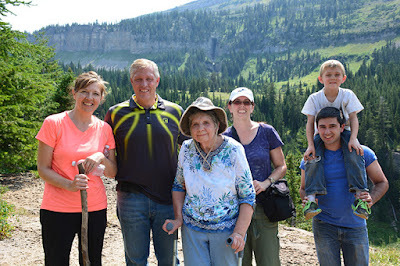 This past Sunday, Aug. 2, my mother and several members of my family hiked the 2.7 miles to the memorial that honored the victims of the tragic lightning accident. This is the first time my mother had returned to the site since she had helped build the monument in September, 1951. The following accounts were written by my sister-in-law, Magen Morse then an account by my mother, Karma Rasband Lambert. Most of the photos I took that day. By Magen Morse: daughter-in-law to Karma Lambert. 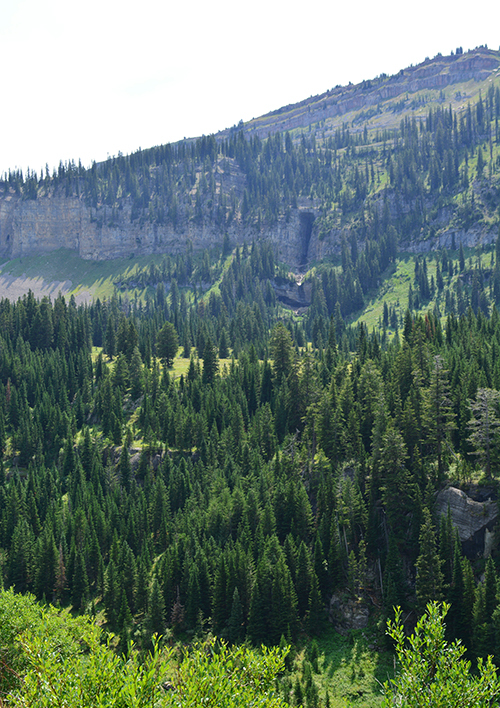 Sixty-four years ago this month a terrible tragedy occurred in Darby Canyon, outside of Driggs, Idaho. Four young girls and their adult leader were killed when lightning struck a tree under which they were sitting. 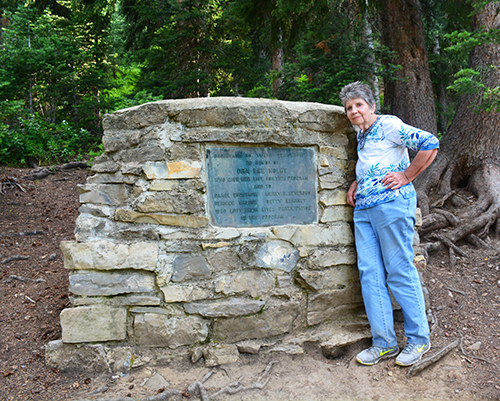 The only survivor of the strike, Karma Rasband Lambert, now 78 years old wanted to honor their memory and share the story with her family by hiking the trail to the memorial plaque that marks the spot where it happened. Karma Lambert’s daughter, Suzanne Kloepfer, broached the idea a few months ago of making this trek saying, “we had heard about this story our whole lives and felt that it be such a wonderful tribute to our mother to be able to return to the site where she lost her close friends and leader. 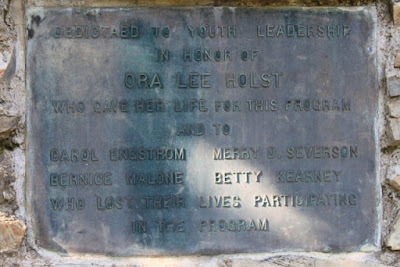 A year ago we learned that she had returned a month after it had happened and helped build the monument that is there now at the end of the trail, so we really wanted to see that.” The husband of the leader who was killed, Ora Lee Holst, worked in a foundry and had the plaque struck to place on the monument. The plaque states that it is dedicated to the youth and leader who gave their lives for this program. What the plaque doesn’t say was that it was a group of about 35 girls who hiked up the canyon that day. They had been attending a young women’s camp sponsored by the Church of Jesus Christ of Latter-day Saints. When the storm started these girls had dashed under the tree for cover and were sitting on the ground when lightning struck. It is believed that Karma Rasband (Lambert) was standing up and so was spared the intensity of the charge. A nurse and experienced scout leader were nearby and they immediately started to try to revive the girls. Ms Lambert remembers being told that they administered CPR to her for about 30 minutes before she was able to breathe on her own. She was carried down on a stretcher. The victims were brought down by horseback. The story made national headlines at the time but what hasn’t always been highlighted is the efforts and heroism of the people of Driggs and the campers after the accident. 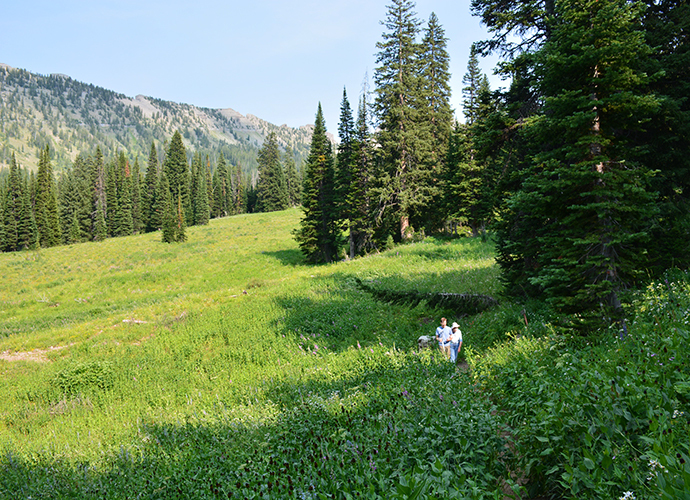 After it happened, the other girls ran down the trail to get help – 6 miles to the campsite. They sounded the alarm and horses and people rushed up the canyon to give any aid possible. Unfortunately, those volunteer horsemen had the awful task of bringing down the bodies of the victims. Ms Lambert recalls meeting the daughter years later of one of those men who had helped, She said he was haunted by the memory of that day. He remembers the girl's long blond hair hanging down across his horse. The hike turned out to be incredibly challenging for Karma but she was determined. Though she walks two miles every day, the elevation and challenge of the uneven trail made the hike a daunting prospect. Her family assisted her all along the way. What they didn’t expect was the kindness of other hikers on the trail. As they went along, Ms Lambert had become something of a trail celebrity. On the many breaks, the family had the chance to share her story with others on the trail. By the end of the day, the hikers were all rallying around Ms Lambert, offering water, snacks, and especially encouragement. View of the wind tunnel from the trail. There has been talk of the monument being taken down from the end of that trail. What the family would like to see is a further explanatory plaque next to the original. The people we met coming down the trail had seen the memorial but they had no idea of the history behind it. We think that it would be nice for people to know about the sacrifice of the leader of those girls and that, though sad, this place is significant to the families of those girls. It would be a shame for the history to be lost forever. The first incident occurred on August 1, 1951. It is a story of tragedy. The second incident took place on August 2, 2015. 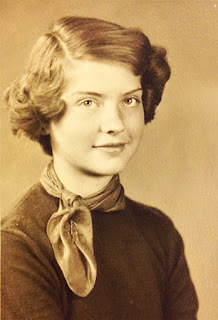 Sixty four years ago, I was on that trail with a group of 37 girls. Lightning hit the group and five were killed, including a leader of the girls. I was considered the most seriously injured of the group. I survived because of artificial respiration administered by Fred Miller. Many wonderfully kind citizens of Driggs came to our aid. Fast forward 64 years later. My children organized a family reunion in August, 2015. Since they grew up with the story of the lightning that took five of my friends, they decided they would like to do the same hike. My daughter, Suzanne, researched, discovered that it was a “moderately” strenuous hike of 2.7 miles. We talked about it and they asked if I would like to join them. I am now nearly 79 years old. I have had both hips and a knee replaced. I foolishly said I would like to try it. That was a mistake. I really was not up to the task. However, since I started, I hated to give up. Joining me were two daughters, a son, a son-in-law, nine grandchildren (the youngest was five years old). Because of all the rest stops, it took me 11 hours. Most people make in a fourth of that time. But what an experience it was! I can see why it is such a popular hike. The scenery is breathtaking. But most amazing of all was the others along the way. They all wanted to help. They offered food, water, equipment, flashlights, etc. When it became apparent that it would be dark before I reached the bottom, several wanted to stay to see me safely out and on my way home. But the disappointing thing is, that no one seemed to know the story behind the monument. Even those who gave guided tours up the mountain did not know what had happened 64 years ago. I would like to see some information about the incident posted. It would be nice for people to know what happened there. 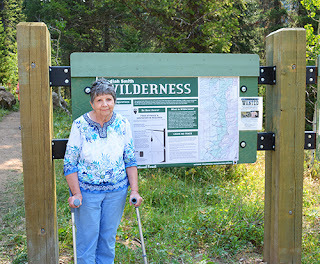 Two other of my classmates, Carol Engstrom and Bernice Malone went along on the hike, plus a girl, Merry Dee Severson, from a younger class, Ora and I, stuck together on the hike as we worked our way up the trail. But Carol who was the life of all parties, and her good buddy, Bernice were not content to lag behind. They wanted to be right up front with Fred Miller. Carol said she wanted to see if she could carry Mr. Miller pack. It was heavy, because it contained emergency equipment, etc. Carol pestered, until Fred relented, thinking she would last only a few minutes. She continued to carry it half the way. It was a beautiful morning. We laughed, giggled, and enjoyed each other’s company. When we came to the Wind Caves, I had a flashlight. Merry Dee and Ora did not have flashlights so we stayed together, while Carol and Bernice were again at the head of the line with Mr. Miller. When Carol and Bernice exited the cave, it was raining. They picked out the perfect spot for our lunch. It was underneath a Balsam Pine. When Ora, Merry Dee, and myself, came out we quickly joined them. However, the last thing I remember was coming out of the cave. The next thing I remember was that I was being carried down the mountain on stretcher. The rest is what I was told by others. Fred exited the cave last to make certain that everyone was out. He quickly asked that we move away from the trees and out into the clearing. Then the most awful scene happened. Lightning struck the very tree we were under. Five were killed. The victims were Ora Holtz, Carol Engstrom, Bernice Malone, Merry Dee Severson, and Betty Kerney. I was the only survivor out of the girls sitting under the tree. Fred Miller, and several of the older girls applied artificial respiration. They worked on all the victims for a long time, but were unable to revive them. Others were rescued, including me. I was considered the most seriously injured. They had to keep applying artificial respiration to me because I would start to breath, and then quit. Dr. Jensen went a little way down the mountain with me to make certain that I could continue to breath on my own. Sheriff Loosli also carried my stretcher. I was wearing nylon underwear. It was melted into clumps. The soles of my shoes were ripped off. The metal flashlight that I was carrying in my pocket burned my hip and there were burns on my body, ironically, some the shape of lightning strikes. The goodness of the people of the Driggs community was amazing. When they were contacted, Sheriff Looslie quickly rounded up men and horses to come to our aid and to carry the bodies out. Dr. Jensen went immediately to the scene to give aid. People came to the church to fix meals for the 145 girls. When news reached the girls remaining in camp, they packed up and were taken to Driggs while awaiting to be picked up by parents. One month later, I went with a group that included Ora Holst husband, Rasmus Holst. He worked at a foundry, and he made the plaque that is on the monument. Horses carried the plaque, and cement powder. We gather stones from the area and built the monument. 64 years later I stood by that monument and remembered those five people and thought how much was lost on that fateful day in 1951. My mother no longer has the burns on her arms and legs but apparently still has the burn on her hip. It took 6 hours to get to the memorial which was longer than anticipated. We thought she would only make part of the hike then tell us her story. However, she was determined and we took our time traversing the trail. 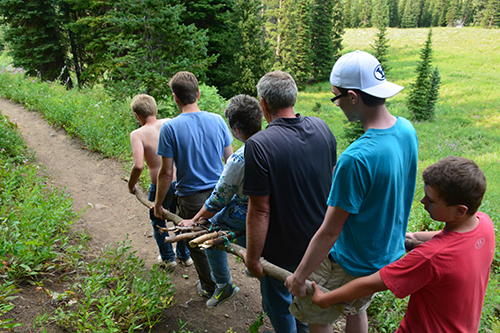 My brother-in-law did make a litter from sticks, shoelaces, belts, as well as rope from a kind stranger, to take my mother back down from the mountain. This did work for part of the way. They made it back to the parking lot at 9:30 that night just as the sun's last rays set. We are all so proud of her and are grateful that we had the opportunity to visit the site and to hear her story along the way. This story is heartbreaking but also so inspiring - your mother, as a survivor of this horrible event, has so much strength and grace - and what an honor to do this for her to commemorate the time she made it back down that mountain. Rhonda, it was truly wonderful to give honor and tribute to not only our mother but to those that had lost their lives. The story ha even more meaning and significance to us. What an amazing story, Leslie! Thank you for sharing something so personal to your family, both heartbreaking and inspiring. 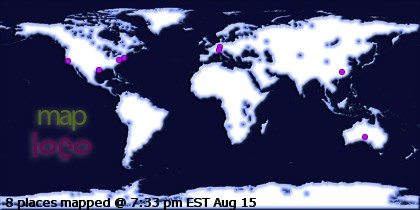 It is so wonderful of all of you to comment on the story! I am so glad that you found it Shannon. It was so nice to have met you on the trail as well. My mother is just tickled by what everyone has to say. She feels like a celebrity. So thank you, thank you for your kind thoughts! We were on the hike with friends the same day as Karma and her family. What an inspiration! We passed Karma and her family on the ascent and again on the descent. I talked with Richard and his family at the monument before Karma reached it. We had hike it before and knew of the story from a local friend. When we passed Karma on our way up, we didn't think she would make it all the way. However, when we passed her on our descent, we were sure she would make it - her determination was so evident. We were so touched to have shared the trail with Karma and her family that day and we fully agree that the monument should be preserved. I was raised in South-East Idaho and hiked Derby Canyon many times in my youth. I had grown up hearing bits and pieces of the story, but it's so great to hear it told by Karma, herself. Thank you! What an amazing story. Be sure to offer it to the church archive office. It is not a happy ending but it should be told, especially by a living survivor of the incident. I sat in Fred Miller's living room as a teenager as he told this story. 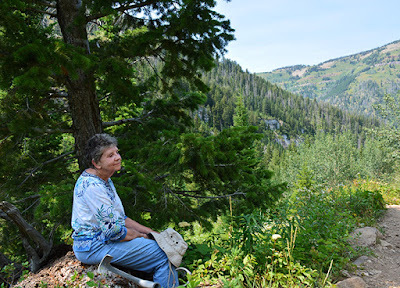 His son had lead our young women group on a hike up Table Rock, and on the way back, we stopped at the senior Brother Miller's house and he recounted the events of the day. Such a tragic loss of life. Thank you for sharing your perspective on the day. I was only 16 or 17 at the time I met Fred Miller, but the story has stayed with me through the years (I'm 40 now). I'm so glad that you found the ending to the story of the hike and that it is a good one. Thank you for your encouragement along the trail. My mother is just tickled by everyone's comments. Thank you! It is wonderful to hear your comments! My mother did not realize that Bethene remarried and was happy to hear so. Thank you for letting her know and for your encouraging words. It is wonderful for you to tell us your story and to know that even though it was tragic, the accident touched (and hopefully saved) many lives. I came across your story, because of friend of mine had shared it on Facebook. I am 44 years old, and I have lived in southeast Idaho all of my life. I went on an overnight hike when I was 14 or 15 years old to the wind caves and I remember our leaders, including the priesthood leaders telling us this story. 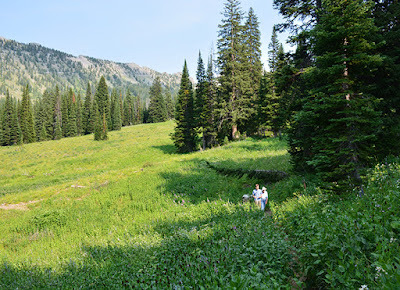 As an adult, I was privileged to go again on this hike as a leader with our girls for their girls camp. I again heard of this story. I have taken my family hiking there more than once. One of those times, my two older children really struggled because the bugs were especially bad. Our youngest, who was about 5 years old at the time was our encouragement and inspiration, desperately wanting to see the waterfall. I was overcome with admiration for your mother after reading this story. I have a son who is 17 years old, and has been very involved with sports, but when he was younger, he completed all needed merit badges. He only needs to complete an eagle scout project now, but due to his commitment to sports and work, he has not completed a project yet. I just read this story to him today. We both thought it was a neat story, and I asked him what he thought. He and our family would like to help share your mother's story with others. I guess I'm just wondering if you would be willing to discuss this with us? Would you be willing to allow him and our family to pursue this project by adding onto the monument, or building an additional one with information, so that the story will not be forgotten? You can email me if you are interested in talking further at kntrose@msn.com. 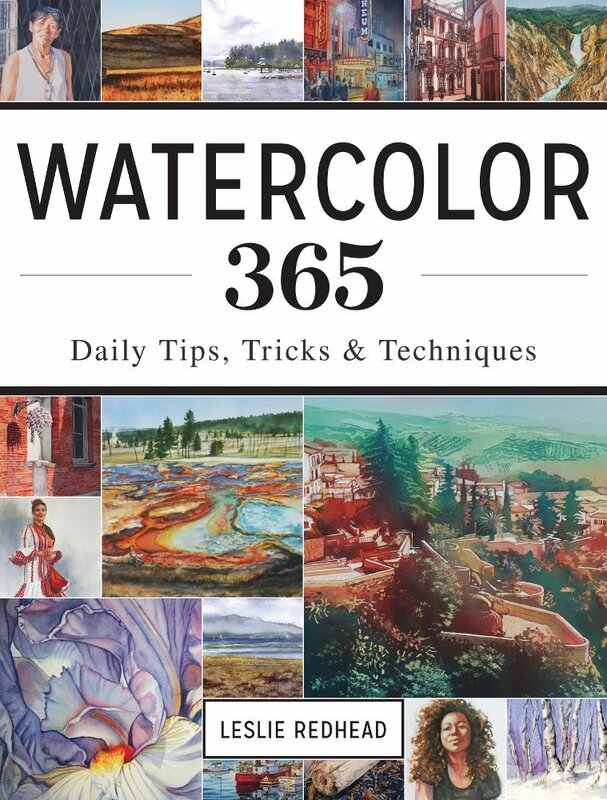 Thank you for your time, and for sharing this on your blog! Thank you for posting this. Nearly 20 years ago I amassed a lot of information about the lightning strike tragedy at Darby as part of a research project. (I was in the 8th grade then.) I conducted phone interviews with survivors, interviewed Bethene's daughter (Bethene had passed away by then), found newspaper articles and funeral programs and hiked to the Wind Cave so my father could take photos for my project. I still have my binder with research in it (I can see it in the bookshelf from where I sit right now), and whenever our ward attends girls' camp at Darby, I offer it to anyone interested so they can know the story. Last year, I typed up Bethene's account of the tragedy and gave it to each of the ward camp directors when our stake attended camp at Darby. I will print off your blog post and add it to my binder so others can know the story from Karla's point of view. I also think it's unfortunate that a summary of the story isn't included as part of the monument. 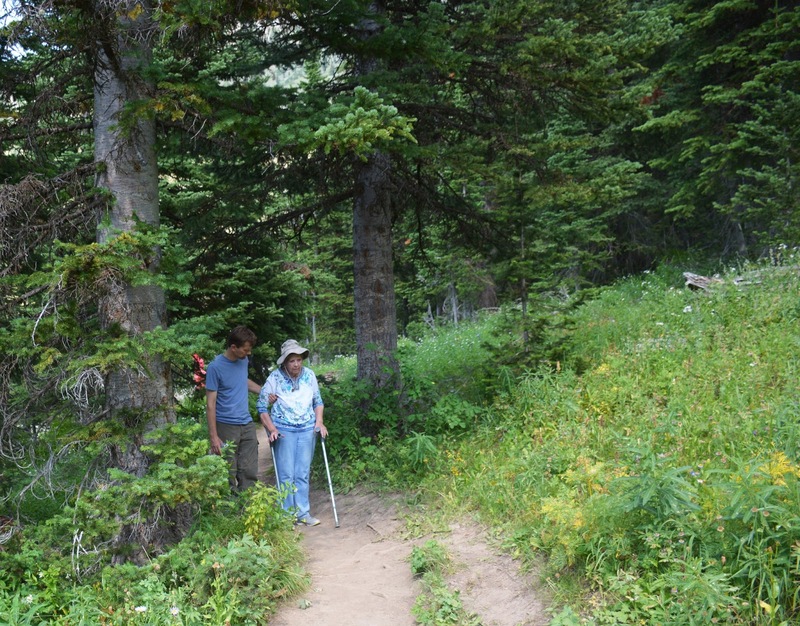 Several times when I've been there, we have volunteered the story to other hikers. Thank you for sharing your mothers story! How wonderful that she was able to return one more time! This story is one our family hears often. Two of my husbands aunts were there that day. How kind and generous for the offer! An addition to the memorial would be wonderful. Thank you for considering this for your son's Eagle Scout project. We will gladly help in any way possible. That is a binder I would love to see and I'm sure my mother would love to view it also! She still has some of the original articles. We all laughed at the misspelling of her name. She was very disappointed that she never had a chance to tell her story but is happy it is being heard now. Apparently she was so shaken by the accident that she couldn't handle any sudden noises, like doorbells and phones, for awhile. Her mother took great care to protect her from anything that could upset her. I am so glad that you shared your story and have preserved the memories of those that were killed. I agree that the memorial should include what happened. Thank you for sharing it with others though. It is amazing to me to hear of all the people that this story affected. Thank you for sharing. It would be nice to hear your husband's aunts stories as well. I'm going to try to send a link to this blog to Ron Miller. He's a dentist in American Falls at Power County Dental Clinic, and he is the son of Fred Miller. I think he'll appreciate reading about your mom's experience. KiwiMcPhie, please do so! My mother holds a special place in heart for Fred. Thank you!